It was the start of a new month, one that should have seen me both step onto that Bead Wagon & try out a new skill (more on that later)... well that Bead Wagon must have been going way too fast to stop to allow me to step on it, as I succumbed before breakfast with a big purchase (but great bargain naturally - see photos below) and I finished the day with Goldmine's Critter Crawl... oops! A'hem... my only saving grace and escape from eating beans on toast for the rest of July is I also scored a bargain on my car insurance renewal, so my beads & bargain have at least been paid for without resorting to raiding my boiler fund - my favourite back of the sofa place for unexpected bead indulgences! So given I've had a narrow escape on a month of eating beans... how is it all going on the budgeting front? 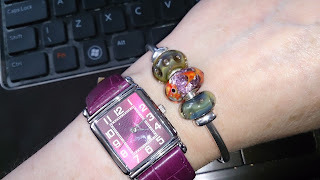 It all started with this post and as I blogged the progress of the May bead embargo I set myself some very challenging goals. Given a bit of reflection, and a bit of spending, I've figured out that those goals were a bit too challenging... time for a rethink! As comic timing would have it - Victoria over at Endangered Trolls just alerted us all to a UK retailer sale as I was writing this... go here for details! So for the next 6 months, including all the unplanned/unexpected spending I've done for the "didn't get back on the wagon" in June and the "the wagon didn't stop long enough for me to get on it" in July I'm aiming for a total spend of around 5% of my net income, from my originally rather harsh target of 1.5% per month! Although as I've spent a lot of that already, ironically what's left is about 1.5% per month - it's going to be a tough year!!! Wow! 3 bangles - they do look great stacked together. 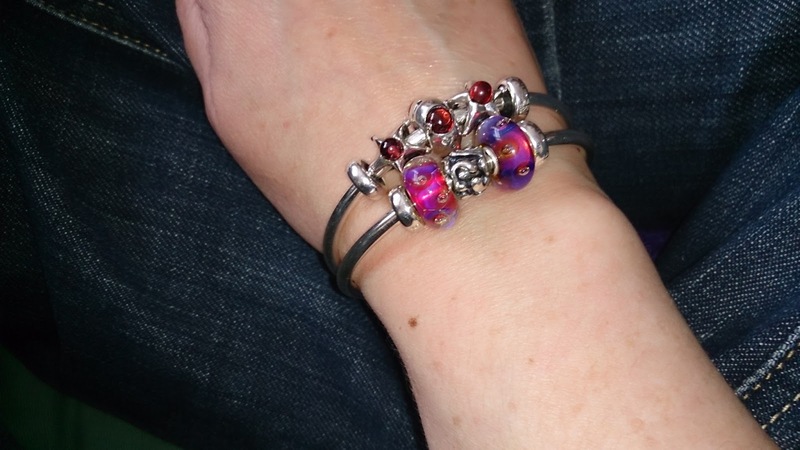 I am waiting for my first TB bangle to arrive, and I hope I don't get the bug and end up with multiples! Thanks, I love the stacked bangle look and I'm afraid to report it's very addictive! 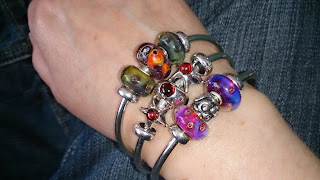 I've been rather fortunate in that I got a very good deal on my first bangle and stoppers on our Troll Date in May, then bangles 2 & 3 were bought privately, but both were brand new and both were Aurora Bangle sets without the Aurora bead and the price I paid for them was on the "amazing bargain" spectrum! I'm mostly okay on new releases as a lot of the main ones I don't mind waiting for them to come up in the "right deal", notable exceptions have been the Summer Stones Kit and the Small & Beautiful beads as I figured I wouldn't be able to get what I wanted if I waited. I know what you mean though about the new releases, as you don't know whether they are must haves until they are showcased, thankfully with the great job Victoria does it does give us all a chance to save up for the ones we think are worth it and the heads up on what's coming up helps massively!! The one I keep meaning to save up for, but haven't managed it yet is the Story 3 string garnet wrap bracelet. I tried one on in April and absolutely love it. I actually don't want any charms for it, just the bracelet on it's own... but I've not managed to save up enough yet as I keep buying those "deals" from my wish lists! Think this may have been what prompted me to buy a string of "garnet chips" this weekend at the Bead Fair, will make myself some pretty garnet single string bracelets in the meantime to compensate! I totally over indulged in summer stones and ended up with 14. I know you haven't done your summer stones post yet, so I am hoping you've ended up with more than me! The Story bracelets are gorgeous. I have the black hematite beaded bracelet and it's great. I was lucky and got it in a sale for just under £60. The garnet one is beautiful and I've been lusting after that and the Peridot. Sadly I am too much of a bead-alholic to divert precious funds into saving for them! Victoria does a fantastic job, and I think that since I've been following her blog it's so helpful in prioritising the "must haves" and it's also helped me such a lot with bracelet design. Before Victoria, I had a collection where nothing really went with anything to make a whole bracelet, whereas now I'm able to think more about bracelet design as opposed to my previous approach of "ooh pretty I'll buy it"! Yay for another bangle convert! Yeah we have both been using the bangle a lot recently, as Kay termed it, it's definitely a "Wash'n'Go" piece of jewellery, plus I can wear it at work as it doesn't interfere with typing or anything else I might be doing. Oh how fab on your Story bracelet, that was a fabulous deal! I did see half price sale a while back but the garnet one wasn't included sadly. I think it will be my first one when I can afford it, it was hard to walk out the shop without ordering it, I think if they'd have had it in my size it would have come home with me, affordability or not! I love Victoria's blog, I've come across brands like Story that I wouldn't have discovered at the time, the sneak peeks are invaluable, without all the info on the Summer Stones I wouldn't have had a fraction of the stones I've been able to pick up as I wouldn't have found them before they'd gone. I've also bought some earlier releases pre-loved this week so my stones collection has gone from 1 or 2 to many more... now where's that Wagon? Torch Talk - Don't set yourself on fire!